Kawah Putih or White Crater is a striking crater lake and tourist spot in a volcanic crater about 50 km south of Bandung, West Java, Indonesia. 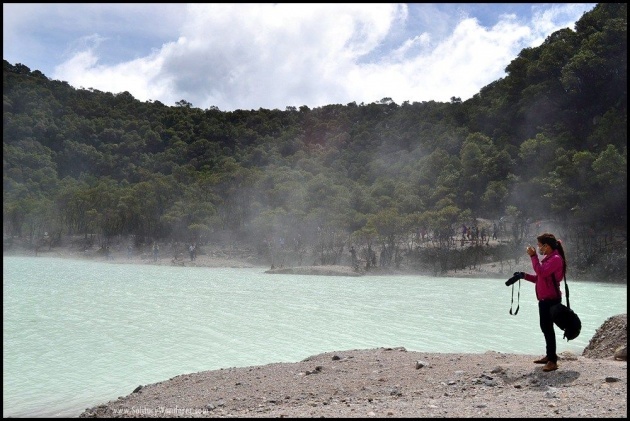 Kawah Putih is one of the two craters which make up Mount Patuha, an andesitic stratovolcano. Mt Patuha is one of numerous volcanoes in Java. Kawah Putih crater lake itself represents a relatively stable volcanic system with no records of significant activity since around 1600. The lake is said to have been discovered in 1837 by Dr Franz Wilhelm Junghuhn, a German botanist who carried out a considerable amount of research in Indonesia until his death in Lembang, just north of Bandung, in 1864. At the time, there were various local stories about the history of the area. Birds were said to be reluctant to fly near the region and villagers in the area tended to regard the forest around the lake as eerie and somewhat mysterious. Over a century after Franz Wilhelm Junghuhn first discovered the lake, in 1991 the Indonesian state-owned forestry firm Perhutani Unit III Jawa Barat dan Banten (Forestry Unit No III for West Java and Banten) began to develop the site as a tourist spot. Access is gained from the left of the main road travelling south by entering the park and proceeding along a 5 km access road.Travel time from the centre of Bandung, depending on traffic in and around Bandung, is perhaps two hours. The turnoff from the main road to Kawah Putih is hard to miss: there is a large signboard to the left of the main road and a prominent entry gate. The entry facilities and the crater location are well-managed by staff from the state-owned forestry firm Perhutani.